Samsung has today announced the upcoming release of five new digital compacts, two of which include digital effects claimed to 'cut through haze'. Samsung has today announced the upcoming release of five new digital compacts, two of which include digital effects claimed to ‘cut through haze’. Due to land on the UK high street in February are the ST70 (£179.99) and ST60 (£149.99), boasting 14.2-million-pixel and 12.2MP resolution respectively. They come with a 27mm and 27.5mm [35mm viewing angle equivalent] zoom lenses. The ST60 and ST70 (pictured) also feature digital effects such as DeFog Clear/Fog Lifting which, the firm claims, ‘cuts through the haze to take clear photos’. Meanwhile, due out in March are the 12.2MP WB650 (£299.99) and WB600 (£249.99) which will replace the WB550 and WB500 models. They come equipped with a 24mm Schneider Kreuznach lens capable of extending up to 15x. The WB650 is equipped with a 3in AMOLED screen and built-in GPS technology, designed to allow users to ‘geo-tag’ their images. While, the WB600 comes with a 3in LCD monitor. Features on both include an HD (700 pixels at 30 frames per second) movie mode. 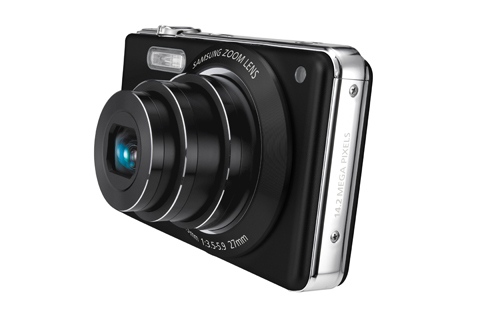 Also unveiled is the PL80, a 12.2MP camera sporting a 28-140mm equivalent zoom. It is due to go on sale in March priced £129.99.